God inspired the Bible for a reason. He wants you to read it and let it change your life. If you are willing to take this challenge seriously, then you will love Phil Moore's devotional commentaries. Their bite-sized chapters are punchy and relevant, yet crammed with fascinating scholarship too. Welcome to a new way of reading the Bible with fresh eyes. Welcome to the Straight to the Heart series. Jesus of Nazareth sparked a massive revolution. A lot of people miss that fact. They are so used to the long-haired, blue-eyed, white-robed storybook Jesus that they imagine he was about as tame and domesticated as many of his churches today. But he wasn't. Jesus was a radical, dangerous revolutionary who made big waves and powerful enemies. He was not killed for preaching pithy parables, but because he claimed to be King. About "Matthew (Straight To The Heart Of Series)"
Phil Moore leads Queens Road Church in Wimbledon, London, UK. He also serves as a Bible teacher and evangelist within the Newfrontiers family of churches. He is the author of the "Straight to the Heart" series of devotional commentaries. After graduating from Cambridge University, Phil spent time on the mission field and then in the business world. He has devoted many years to the Hebrew and Greek Scriptures, and he brings them to life in the language of today in the Straight to the Heart series. The first three volumes - Matthew, Acts and Revelation - were published in July 2010. Genesis and 1&2 Corinthians will be published in November 2010. Phil is married to Ruth and they have three young children. Together, they love eating strange and exotic food, watching movies with lots of popcorn, and reading books by Roald Dahl. Phil's children complain that his own books do not contain enough pictures, talking animals or chocolate factories. A new series of devotional commentaries enabling people to get to grips with the Bible one bite at a time. Focusing on key sections, Phil Moore gives a useful introduction to each book of the Bible. There will be 25 volumes in all, each containing approximately 60 readings. 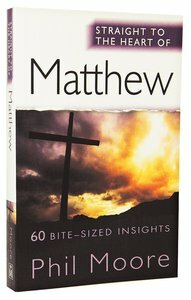 The tone is light and the text is full of useful application, making it a great resource for daily devotions. It is backed by substantial scholarship for those who want more. These readings from 1 & 2 Samuel provide insights into some of the greatest characters of the Old Testament, notably into the life and motivations of King David. If you think that 1 and 2 Corinthians are somebody else's mail, then you need to think again. Paul wrote them for you and he wrote them for me. Right from the outset, his goal was far bigger than the city walls of Corinth. He copied them to "all the saints throughout Achaia" and to "all those everywhere who call on the name of our Lord Jesus Christ." They are God's message to believers in any local church in any place at any time. They describe the kind of church God can use.